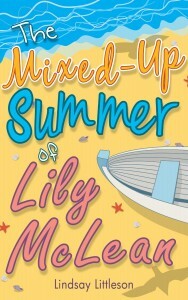 The Mixed-Up Summer of Lily McLean, by Lindsay Littleson, was the winner of the 2014 Kelpies Prize. And no wonder. It has engaging characters and an exciting plot that zips along at a cracking pace – I read through it in one session last night after it automagically appeared on my Kindle a week earlier than I’d expected. Lily McLean is a normal schoolgirl with the usual family dramas – annoying little brothers, a moody teenage older sister, and a baby sister who leaks from both ends. Her mum is on her own, with Lily’s dad dead and her step-dad out of the picture. Life in their little house is overcrowded and bad-tempered, so Lily finds refuge in a Harry Potter-like cupboard under the stairs. Only the prospect of getting away to Millport on the island of Cumbrae for a week, albeit in the company of her battleaxe Gran, keeps Lily sane. But maybe not sane enough. She hears voices. Well, one voice. A ghostly voice giving her cryptic warnings. “Don’t go to Millport!” Is she being haunted? Why does the voice sound familiar? She wishes she could tell her friends (popular Rowan and geeky David) but how would you broach the subject? She heads off to Millport with her Gran, meets up with the hyper-kinetic Aisha, and tries to have a good time, but the warnings become more specific, and the ghostly presence more solid. Who is the ghost? What’s so dangerous about going near the water? At heart, this is a book about family and friendship, all tied together with a clever supernatural plot that resolves itself beautifully. Lily is an engaging narrator, very fond of lists that adorn the start of each chapter, and her friends and family are a diverse and interesting group. I loved geeky David and Lily’s ailment-obsessed Gran. Even baby Summer with her toy lion are packed with personality, despite their limited vocabulary. This is an amazingly assured début novel. Lindsay Littleson is a terrific writer, and I for one can’t wait to see what she writes next.